Today is the first day of the Mistletoe Make and Bake! Starting off the fun is Sherri Falls of This and That. She has a super duper cute "Wish List" project for you. She is giving away a pack of 8 of her new patterns. I want to win them!!! LOL but I can't. In addition, there will be a grand prize drawing, so be sure to comment on each blog each day to enter the grand prize drawing. Be sure to check out Sherri's blog for her project of the day. 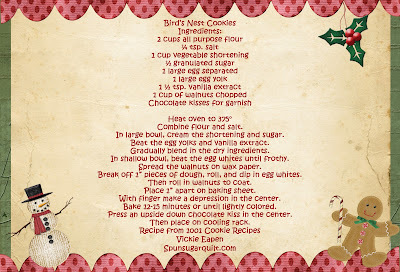 As part of the fun, each of us will be posting cookie recipes and a short topic each day. My first recipe for the tour is Bird's Nest Cookies. My husband and I, yes husband and I, started making these a few years ago. You see he's mainly the chef/baker. I occasionally go on a streak of baking or cooking...occasionally. I am really lucky to have him. To download and print the pdf version of the recipe card click here! I believe that Santa was a real person, St Nicholas. When people fill the stocking of their sleeping children and leave gifts for kids they are merely continuing the memory of a great and kind person. I have been asked atleast 50X this weekend when Santa Claus is coming. Try telling a 3 year old they have to wait another month! Let me do the math..50 X 41 days to go...is 2050 times being asked when Santa is coming to town. Whew. These cookies sound great! We will have to try them! Thanks for sharing! Thanks sound yummy love the recipe card!! Can't wait to try the cookies. I believe in Santa Claus and all he represents! Your cookies sound terrific! 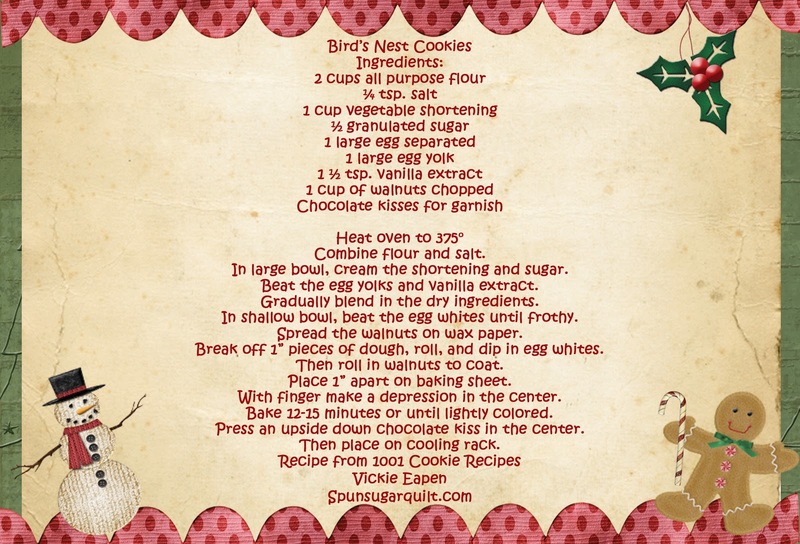 Great cookie recipe, I have to try it at once. Great cookie recipe. I heve to try it at once. Of course I believe in Santa...when you stop believing, he stops giving! And the best way I've found with toddlers is an advent calendar of some sort, particularly if it involves a little treat each day...it teaches patience if nothing else. Love having new cookies recipes tat have been test driven! Thanks! Enjoy all the questions from your little one, they will end all too soon. Sigh. Thanks for sharing the recipe. I'm no getting the "When is Santa coming?" question, I'm getting..."I want this, and this and this and this...."
only 2049 times to go....keep up the spirit! The spirit of the season is upon us. I love seeing the wonders of the season from my 6 grandchildren (all 4 and under). I'm so blessed. Thank you for sharing all the recipes, your time and creative talent. Thanks for the cookie recipe. I can't wait to try them. These sound so good! Thank you for sharing your recipe!! Love the recipe. This is so much fun. Thanks for sharing. Thank you for the fun this week! And, thank you for the recipe! I hear what you're saying! Amelia is soooo ready for Santa to visit. My husband will cook dinner anytime, but baking--no way!! Lucky you! Thanks for the cookie recipe. Oh...these sound delicious and fun to make! Thanks for sharing with all of us! Yummy recipe Vicki. Thank you. And this bloghop is great fun. Thanks for the recipe...sounds yummy! The cookies look really yummy - I'm having the same problem when is Christmas - can we listen to Christmas music - Ha ha - I love it! Thanks for sharing your (or his) recipe. I believe in Santa!!!! Thanks for the recipe. This is going to be so much fun! Thanks for sharing the recipe. Sounds scrumptious! A new recipe to try! These sound like fun. Thank you. Have you used your new mixer to make these yummy cookies? Walnuts and Christmas a great match! What an interesting recipe - I've never seen this one before. I guess when I make these I have to share, right? They look yummy! Thanks. Thanks for another yummy sounding recipe and for taking the time to join in this blog hop. Hopping is fun! And after sampling all these cookie recipes I will NEED to do A LOT of hopping!! This recipe sounds wonderful, thank you for sharing! What a great post! Can't wait to try the cookies. Thanks for sharing. Love the blog. It's always fun to try new recipes. I love to try new recipes. Love this blog! thanks for sharing. Sound so yummy, thanks for sharing the recipes. I can't wait to see what other recipes there are too! Thanks for the recipe, they sound delicious. That's exactly what I believe about Santa/St Nicholas! I remember when I was in 4th grade telling people that I still believed in Santa because I believed in the history and story of St. Nicholas. I've never heard/tasted these cookies before....love the recipes everyone is including...I'm following the layer cake quilt-along hosted by Moose on the Porch. You ARE busy....thanks! I believe in the spirit of Santa, and the kindness that is part of that spirit. The recipe sounds good. Thank you. I absolutely believe in Santa Claus...There's a bit of him in all of us. Some people just let him out more than others. Thanks for the cookie recipe. Thanks for participating in the Mistletoe Make and Bake. I'm loving all the recipes. Just the name of Bird's Nest Cookies is cute! Thanks for kicking off this tour. I believe in the Christmas spirit. This recipe sounds great. Thanks. My goodness..this one sounds scrumptious.Thanks for sharing..and on such cute cards also! !